The United States Senate elections of 1858 and 1859 were elections which had the Republican Party gain five additional seats in the United States Senate, but the Democrats retained their majority. That majority would erode in 1860 with the secession of the southern states leading up to the Civil War. 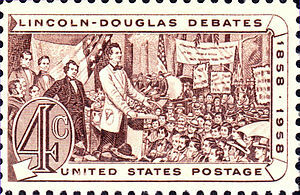 In Illinois, incumbent Stephen A. Douglas (D) and challenger Abraham Lincoln (R) held a series of seven debates, known as the " Lincoln–Douglas debates."